April 21, 2013 the Hair stuff., the Magazine stuff., the Makeup stuff., the Review stuff., the Skin stuff. InStyle’s Best Beauty Buys of 2013 … and what I think of ’em. So, May is one of my absolute favorite months for fashion magazines (I think I say that every month, right?) because this month tends to see the widest amount of beauty features in such publications. People StyleWatch, Lucky, Marie Claire, and InStyle all proclaim their May issues as dedicated to beauty, and I’ll be honest- I’ll eye a magazine on the stand at a grocery store and I’ll quickly flip to the beauty section, and if it piques my interest in any way, I’ll buy it. The beauty sections are always my favorite, teeming with hair how-to’s, reviews of new products and the like. One close-up shot of Kerry Washington’s makeup at last month’s premiere complete with a break-down of what products were used, and I’m literally buying the magazine just for that one page. 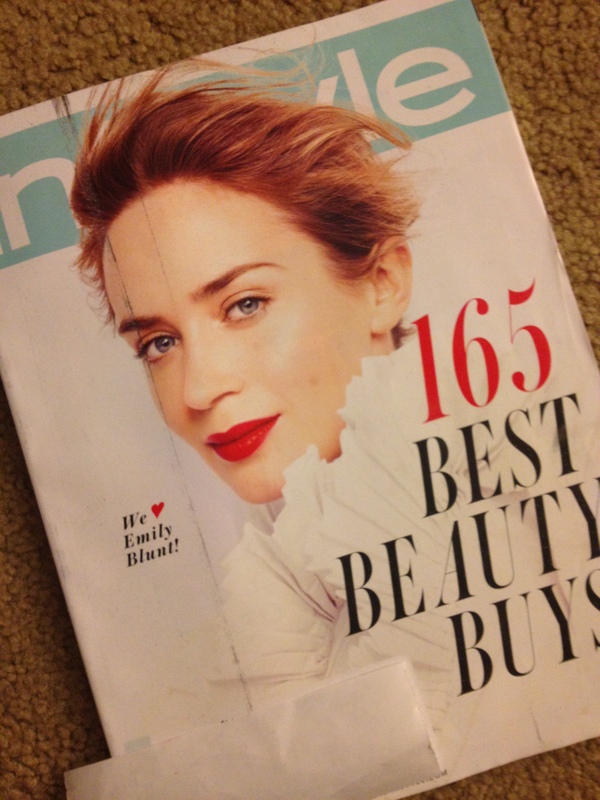 My May issue of InStyle magazine came yesterday in the mail and sure enough- 2013’s Best Beauty Buys can be found on page 297! I like lists like these because I like comparing the magazines choices to what I already have and agree with, what I’m still curious about, and what products I hate. Additionally, I’ve begun to take these “best of” lists more and more seriously because I’ve become increasingly interested in curating the best kit possible, even if it means a little extra investment here and there. I trust InStyle for this and can tell that their choices are honest because a lot of the “winners” don’t change from year to year (whereas I feel some publication’s praises are simply based on what’s newest to hit the market). Now, I won’t be mentioning my thoughts on every product that InStyle lauds, but there are a few I found to be worth commenting on. 1. Best Inexpensive Lipstick- Cover Girl Lip Perfection Yes. The texture of these suckers does not feel cheap, despite the drugstore price (and the pigment lasts forever). What’s great about this line is that the color range feels expensive and a little more edgy as well, whereas drugstore lipstick in the past seemed to just offer cute variations on frosty pink for the most part. I still proudly proclaim their shade called Spellbound as the best shade of holy-crap-that-is-no-joke-magenta for under ten bucks. 2. Best Inexpensive Mascara- L’Oreal Paris Voluminous Original Is it just me or has this stuff sucked every time I’ve tried to give it another chance? I’ve probably purchased this formula a total of three or four times over the years, just on the basis of knowing it’s reputation and thinking that it’ll perhaps work out differently this time. But like Maybelline’s Great Lash (which I’ve consistently detested), this stuff is just goopy and can’t handle the pressure of a second coat (which is a bloody shame since I tend to cap things off at five coats). 3. Best Overall Mascara- Dior Diorshow I’ve purchased this stuff twice in my lifetime, which, in conjunction with my comments on the previous product, proves that I am certifiably insane in that I think if I do the same thing over and over I’ll somehow, at some point, land on different results. In my little library of thoughts, Diorshow is categorized as the most overrated beauty product in existence. The brush is too big to the point where you can’t control the product easily or put as many coats on without things getting into Shelob territory very quickly. And what’s more, there’s fragrance in it. For why?! 4. Best Powder Blush- NARS Always and forever, yes and yes. I have three shades of NARS powder blush, and they are just the happiest, most exciting colors to wear. Your mood just changes when you dot on one of the shades on to your cheeks. While I love wearing their cream version in Lokoum on a regular basis, I took a dare last year in purchasing their powder formula in Exhibit A, an absolutely terrifying shade of vermilion at first glance (and I’m pretty sure the bride I most recently used it on hyperventilated when I first showed it to her). But just a couple dots on the cheekbones and BAM! You look like you’re glowing from the inside-out. 5. Best Inexpensive Shampoo and Conditioner- Pantene Pro-V Classic Just deal with my rant for a moment: When you’re paying four bucks for a ginormous bottle of shampoo, this should tell you something- that apparently there’s nothing in that bottle worth any money to raise the price over four bucks. Seriously, read the label on the back of your Pantene shampoo or conditioner bottle and tell me if you can identify any of the ingredients other than water. The first ingredient of Pantene’s shampoo is water, the next two are detergents that strip your hair, the next is sodium chloride (table salt), and the next is dimethicone (which, while being toted as great for reducing frizz, also saps your hair of moisture). The list goes on, but nothing in these products can be considered nutritious for your hair. It’ll clean, but it’ll strip. If you’re going for a cheaper shampoo and conditioner, at least go for a sulfate-free brand. I also find shower products like these more worrisome too because we rinse a lot of this stuff down our drains and it gets swept up into our oceans and water systems, and I can’t see dumping gallons and gallons of synthetically-derived Pantene as ultimately good for our water supply and ecosystems. 6. Best Lipstick- Tom Ford I honestly wouldn’t know if I agree with this choice or not, because I’ve never tried Tom Ford’s lipsticks. My life just isn’t at the point yet where I can justify fifty dollars for one tube of lipstick. You read that right- fifty dollars. I feel like I could possibly justify such a price for face makeup (if you were to wear it everyday) or something that would last you a very long time, but I don’t wear lipstick everyday (rarely, actually) and lipstick isn’t even meant to last for an extremely long time. So I’d either feel compelled to use it every single day (which I wouldn’t) or make the tube last at least two years (at which point it would’ve expired anyhow). No win. And what’s more, I’m just convinced that there are too many quality lip colors out there for twenty and under. 7. Best Concealer- Cle’ de Peau Beaute’ See above. Seventy bucks for concealer? There’s no way. Well, then again, I at least know I probably would use this everyday, and just a little bit each time. I’d get my money’s worth! And it is supposed to be an absolute miracle worker on all flaws and blemishes, and … you know what … no … I can’t keep talking like this. Just slap me. 8. Best Curling Iron- Hot Tools Spring Iron Yep, this is the one. I have the 1.25″ and I love it. I just wrap sections of my hair around it (and I skip the clamp; I just wrap and hold) and nothing works better at creating easy waves. Don’t pay more than fifty bucks for a curling iron or curling rod. Save your biggest hunk of change for a high-tech flat iron. 9. Best Lip Balm- Smith’s Rosebud Salve Sure, the tin is chic in a French-apothecary-kind of way, but there’s a little too much petrolatum in this stuff for my taste. Petrolatum, derived from petrochemicals, is known for ultimately disabling your lips from being able to remain moist on their own (hence the legend of “ChapStick addiction”). Petrolatum merely acts as a barrier on your skin’s surface (not an actual moisturizer), and it simply traps whatever moisture is already on your lips in place. Your lips, over time, basically un-learn how to replenish their own moisture. Rub a petrolatum-based product all over your body and over time, this kind of barrier will prohibit toxins in the form of sweat and sebum from escaping the skin’s surface like they’re supposed to. This is why I try to stay away from most drugstore lotions and “moisturizers”, because they’re laden with petrochemicals that can, in a worst-case scenario, really mess up your endocrine system. I am forever loyal to Burt’s Bees Beeswax lip balm because I only find myself needing to apply it perhaps twice a day, and it is free of petrochemicals. 10. Best Eyeliner Pencil- MAC Eye Kohl Could the name “Smolder” be more appropriate? This stuff is black magic. Devilish, delicious, I-am-Jack-Sparrow’s-wickedly-awesome-pirate-girlfriend magic. NARS!!! Yes!!! When I was in hair school, my teachers always told me that Pantene Pro-V was THE WORST thing you could ever put in your hair. Worst than the other cheap ones on the market. They said that it has wax in it to make your hair “shinny”. I’ve never forgot that and I will never buy Pantene Pro-V. Hot Tools Spring Iron- Ah SO yes! my hot tools iron and I are best friends! People always ask how I do my curls… 1 inch Hot Tools curling iron, curl it normal, and then run your fingers through it. Boom! Michelle Spencer’s curls! Glycol Distearate (the ingredient that comes immediately after the first couple I listed) is the culprit for that waxy substance in Pantene. While it is probably meant to (supposedly) make your hair shiny, it’s actually more meant to just make the product itself shiny. You know how Pantene looks all pearly and feels like this luxurious pearly cream in your hand? That’s the glycol distearate. Just another example of how a lot of drugstore shampoos are just kind of these petrochemical-filled illusions.